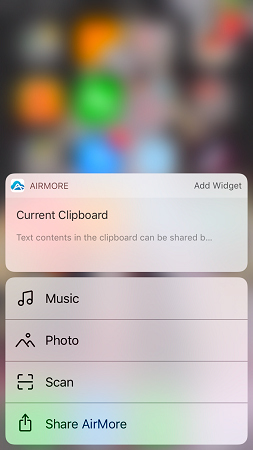 AirMore 3D Touch and widgets features are available now! On iPhone 6s and later manufactured versions, 3D Touch and widgets are the special features which are preferred by many users. Now, AirMore has added these two features on the latest iOS version. In this article you can read the detailed guide on how to use AirMore 3D Touch and widgets Features. First, you need to download the latest version of AirMore on App Store. For the first time to enable the 3D Touch feature, you need to start and keep the AirMore app running in the background. Afterwards press the AirMore icon firmly. You can see the available quick actions on the list, such as “current clipboard”, “music”, “photo”, “scan” and “Share AirMore”. Choose any quick action you want. Swipe to the right on your Home or Lock screen. Scroll down to find AirMore. Tap the “+” icon and choose “Done”. Press AirMore icon firmly and tap “Add Widget”. Then you can see the AirMore widget. Swipe to the right on your Home and tap “Show More”, you can see different icons on the screen, such as “Scan”, “Photo”, “Music” and “Files”. In summary, the aforementioned two features are added to enable users to find quick actions efficiently and conveniently. Download the latest version of AirMore on your iOS device to enjoy the new features now! The Latest iOS 10: What’s New? How to Disable Samsung’s Annoying Bixby Button?